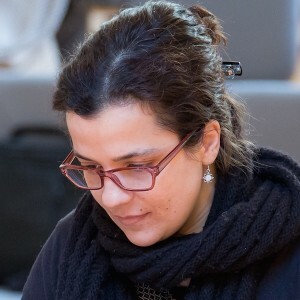 The compositions of Sofia Borges (Portugal, 1979) cover a wide scope of formations ranging from solo, duos, trios, ensemble, choir, orchestra to electronics and interactive music. She has become increasingly involved in collaborative work, composing music for theater, dance, short films, video and installation. Before studying composition, computer music and multimedia at the Escola Superior de Música de Lisboa, she studied percussion and drums at the National Conservatory (Lisbon) and Hot Clube de Portugal (Luís Villas-Boas Jazz School). In 2013, she graduated as Master of Arts in Multimedia Composition at the Hochschule für Musik und Theater in Hamburg, Germany. Her activity as a percussionist and performer combined with her interest in ethnomusicology has led her to participate in concerts, festivals and conduct workshops all over Europe, Macao, Taiwan, Brazil, Australia and New Zealand. Sofia participated in Tenso Young Composers Workshop 2015.